Want to record lectures and interviews on the go? 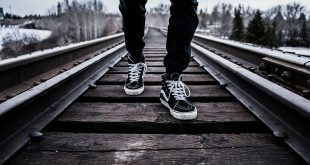 The good news is, you don’t have to use a full-blown computer to do some basic or even moderate level of audio editing or create your own music. 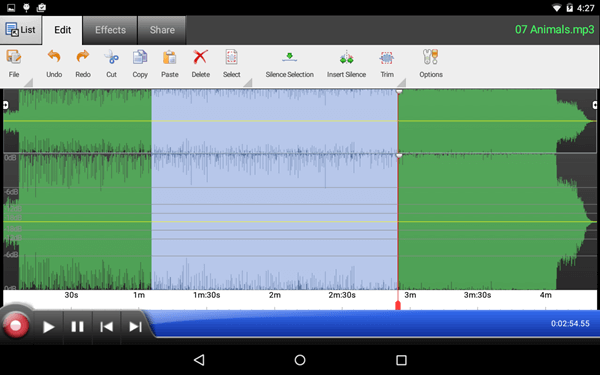 There are several different powerful apps for android to edit audio on a day to day basis or on the go. 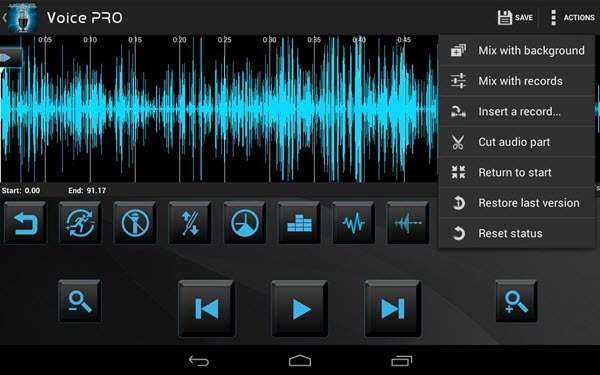 We’re going to look at some of the best audio editing applications you can try on Android. Let’s Begin. Voice PRO is one of the most popular apps that is filled with features. Using Voice PRO you can record your voice or music in 100 different formats with up to 320kbps bit rate and up to 48000 HZ sample rate. In fact, you can even encode the audio file in 8 or 16 bytes and register them in Mono or Stereo formats. Other features of the app include but not limited to backup and restore recording files from cloud services like Google Drive, Dropbox, etc., ability to add real-time background music to your recordings, mix and merge recordings in any format, ability to remove vocals, file conversion, support for encryption, call recording, ability to tag certain parts of the music, earphone control to micromanage background effects, etc. Additionally, the app can also convert your voice records to text in 40 different languages. However, you can only unlock this ability via in-app purchase. If you are looking for a good app to record your voice or other stuff then Voice PRO is for you. Price: Voice PRO is a completely paid app ($12.99). But, thanks to Google Play return policy, if you don’t like the app, you can still return it within 2 hours from the time of purchase. Audio Evolution Mobile Studio’s user interface actually resembles a good audio editing software. Of all the apps in this list, Audio Evolution Mobile Studio has some of the best features that let you do some advanced audio editing. 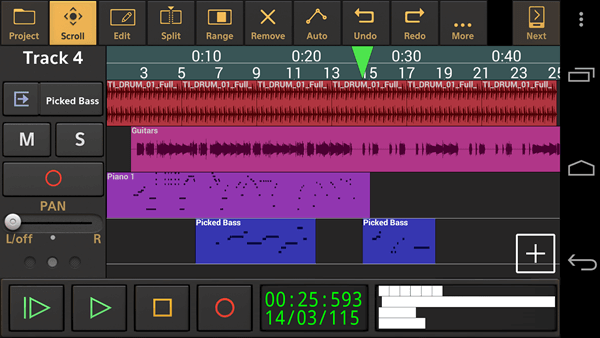 Using the included tools, you can do multitrack audio recording, perform basic actions like move, cut, trim, and remove tracks, MIDI sequencing, sample rate conversion, latency correction, ability to import and export files in different formats, create separate audio files from different audio tracks, etc. Best of all, the app has support for real-time background effects, virtual instruments, and each track in your audio file has its own controls to micromanage specific tracks as and when needed. If you want to, you can even connect to USB audio interfaces and record/edit audio files from there. However, this feature requires an additional in-app purchase. 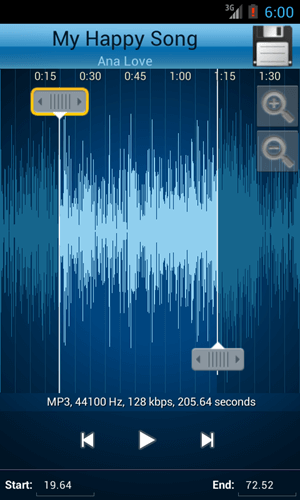 Price: Just like Voice PRO, Audio Evolution Mobile Studio is a completely paid app. You can purchase the app directly from the Play Store for $6.99. The good thing is, there is a free trial available with limited functionality so that you can give the app a test drive before buying. 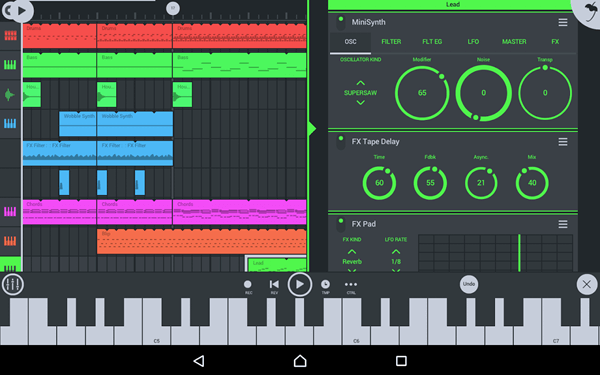 FL Studio Mobile lets you create and edit your own music using high-quality synthesizers, drum kits, sampler, and sliced-loop beats. If need be, you can customize the layout of the drum pads and virtual piano keyboard. Additionally, you can further manipulate your recording or music using a wide range of included effects like chorus, auto ducker, limiter, filters, delays, reverb, etc. Moreover, the app also lets you browse sample and presets while listening to the actual and proper previews. If you want to, you can even change the pitch of the samples and presets while previewing for better selection. Other options of the app include but not limited to the support for MIDI controller support, MIDI file import and export, adjustable options and settings on per instrument basis, support for exporting audio files in both MP3 and WAV formats, step sequencer, etc. If you are looking to edit your existing music or to create your own, FL Studio Mobile is for you. Price: The app is priced at a whopping $15.99. Additionally, you need to do in-app purchases if you want additional music content and synths. But if you don’t like in-app purchases, you can always download those files from the internet and manually add them as needed. Though the price looks a bit high, it is worth your every penny considering all the options, user-friendliness, and customizability. Lexis Audio Editor’s user interface resembles slightly of Audacity due to its waveforms, sliders, upfront options panel, etc. Using Lexis Audio Editor you can record and edit audio files with just a few taps. Though Lexis Audio Editor is not as powerful as the above apps, it sure is helpful as long as your editing requirements are simple. i.e, you can cut, copy, and paste streams, normalize, reduce noise, delete or insert streams, trim, add fade in and fade out effects, change pitch and tempo, mix the current audio file with another audio file, etc. For editing, apart from importing regular audio formats like WAV, mp3, FLAC, m4a, aac, and WMA, you can also import video formats like mp4, 3gp, and 3g2. Lexis Audio Editor also has 10 band equalizer and composer to further customize your music or recordings. As I said, if your needs are simple then try Lexis Audio Editor and see if it fits your needs. Price: Lexis Audio Editor is free with ads and restricts you from exporting audio files in mp3 format. You can remove these restrictions via in-app purchases. WavePad is very similar to AudioDroid in that it lets you do basic editing tasks like cut, copy, paste, trim, delete, silence selection, etc. Other than that, you can also add various effects like compress, normalize, amplify, noise reduction, etc. The good thing about WavePad is that it is very easy to use thanks to its simple and mostly clutter-free user interface. However, the bad thing about WavePad is that it doesn’t support all Android devices. For instance, of the two Android devices I have, WavePad is only compatible with one of them. Other than that minor inconvenience, WavePad is a good little app. Price: The base version of WavePad is free. 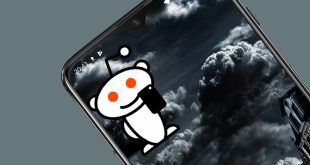 It is limited in terms of features and contains ads. You can unlock individual features via in-app purchases or buy the full version for a $14.99. 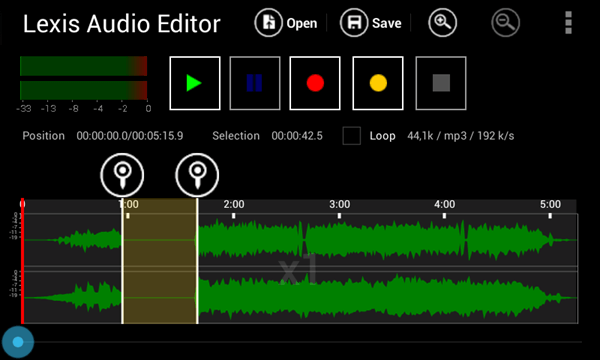 WaveEditor is a professional audio editing app for Android which also lets you record, master, and edit audio files on the go. It supports multiple formats and lets you edit without much effort. You can mix and edit multiple tracks using visual tools like FFT, Oscilloscope, Spectrogram). According to WaveEditor, you can import audio files in over 30 different file formats but export is limited to AIFF, FLAC, MP3, OGG, PCM, and WAV. It also has a standalone audio recorder along with an in-editor audio recorder which lets you record audio even during editing. It has all the major editing functions like zooming, panning, and selection. You can also add macro processes such as Fade, reverse, and invert. Price: WaveEditor is free on the Play Store and you can unlock all the locked features for around $3.99, plus you get a recorder widget. Not every one of us is looking for an all-powerful audio editing app. More often than not, our need is as simple as cutting and trimming songs or other audio files. If this is all you need, then you don’t have to use heavy apps like the above ones, just use MP3 Cutter and Ringtone Maker. As you can tell from the name itself, you can use this app to cut or trim audio or music files. The app also provides a simple way to set those audio files as your ringtone with just a few taps. These were my picks for best Audio Editors for Android. Some apps like Voice PRO and Audio Evolution Mobile Studio are designed for professionals, there are others like WaveEditor and Ringtone Cutter for more casual users. If you think I missed any of your favorite Android audio editing apps then comment below and share them with me.